Of the hundreds of winemakers that I know or know of, I can safely say that they are a breed apart, an impassioned group who devote themselves to their craft more than any category of perfectionists that I know. They live and love to get it right! at Vittorio’s, shown above with its owner, Victor Magahaes. A few weeks ago, the annual DePortola Trail “Big Red Fest,” a showcase of nine key wineries on DePortola Road in Temecula, opened their doors to a series of new releases and barrel tastings. This area of the Temecula Valley, which has about 36 wineries total, is much more rural in look and feel, kind of like the Silverado Trial is to the Napa Valley. Owners and winemakers here are eager to tell their story. It’s the road less traveled but widely talked about. On the DePortola Trail, Gershon Bachus Vintners is a special winery turning out high quality whites and reds since 2005 on 20 acres. Under the guidance of Denton since 2013, the winery produces some 28 grape varietals. Denton has a remarkable local history as a winemaker in Temecula. He was born there and has seen more and worked more of the many varied vineyards and wineries than anyone I know. He had winemaking responsibilities in his teens. 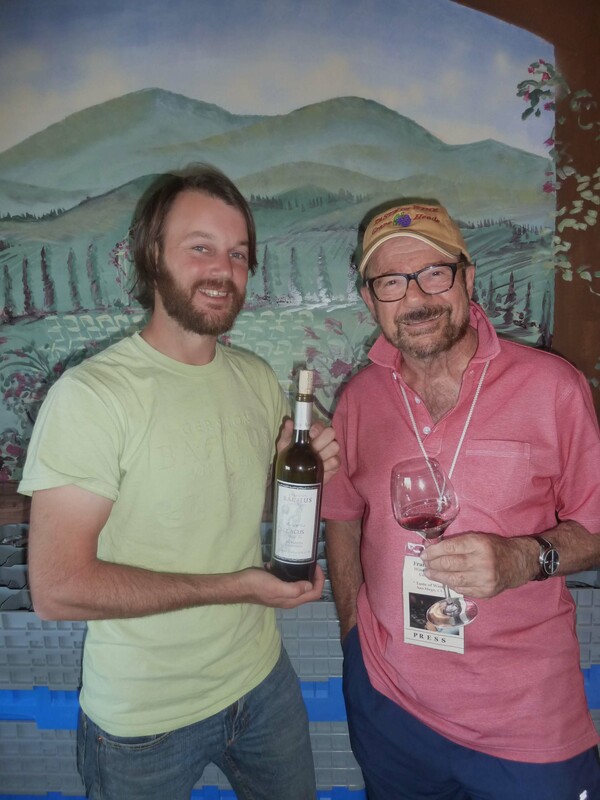 His big break came in 2006 when he was hired to help make wine for Temecula Valley Wine Management, a group led by Michael Rennie and Tim Kramer, who crafted the wine journey for many wineries, from crushing to barrel aging to bottling and marketing. Denton got involved with some 100 varietals of wine grapes in his eight years with the management team. He has a grip on what works best in this much discussed wine country. “In the barrel tasting, I get to know if a wine will be flavorful, or not,” he disclosed. A significant style of grapes turned out to be Italian and Rhone Valley. Varietals like Barbera, Sangiovese, Grenache, Syrah and Mourvedre all have a place in his creations. Pricing is generally $30 to $60 for an estate blend. In addition to Gershon Bachus, be sure to visit: Fazeli Cellars, Robert Renzoni Winery, Oak Mountain, Leoness Cellars, Danza Del Sol, Frangipani Estate Winery, Cougar Vineyard & Winery and Masia De La Vinya. See more at DePortolaWineTrail.com. Santa Maria-based Foxen Vineyard and Winery came to San Diego’s wine dinner specialists at Vittorio’s and the place sold out. 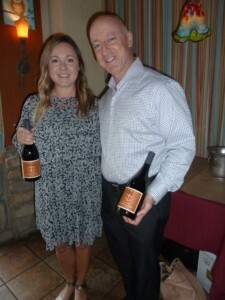 California Regional Sales Manager Kaitlan Hite brought six Foxen wines to the event supported by a Vittorio’s four-course dinner, spotlighted by a roasted leg of lamb with garlic-herb stuffing. Hite’s Pinot Noir selections total nine different vineyard favorites including a local Santa Maria brand and my favorite, a 2014 Foxen Sebastiano for $39 that oozes with silken red berry flavor. Vittorio’s will present DAOU Vineyards and Winery of Paso Robles at 6 p.m. June 29. This is a premier winery in Paso rapidly gaining in reputation for its great reds. The Cabernets will flow as well as a new, exciting blend for less than $20 called “Pessimist.” DAOU’s regional sales manager, Daniel Brunner will do the presenting. Cost is $54.95 person. Call (858) 538-5884 for your reservation. First a change in the date we had for the Thornton Winery Champagne Jazz headliner Keiko Matsui originally scheduled for June 17. It has now been moved to 7 p.m. Sept. 23. Check out the details at com. L’Auberge in Del Mar presents new offerings of Beer, Wine and Champagne flights, six flights in all. The premium “Somm” flight features Napa Valley, Oregon and Argentina greats. Check out com. The Summer of Riesling Warehouse Tasting happens at Truly Fine Wine in San Diego, from 10 a.m. to 4 p.m. June 17. Taste through a super lineup for the summer. Cost is $5. Call (858) 270-9463 for details. Meritage Wine Market in Encinitas has a class exploring five key wine regions of France from 6 to 8:30 p.m. June 20. Sip and savor your way through 14 wines with a summary of each region with bites of cheeses and meats from each region. Cost is $79 each. 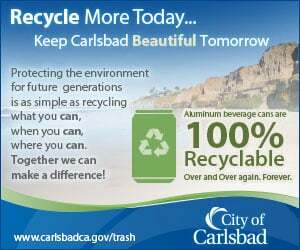 Call (858) 442-2749. Seasalt Seafood Bistro in Del Mar presents a SIMI Sonoma wine dinner at 6 p.m. June 22. SIMI sources from five different vineyards in Sonoma for Rose’, Chardonnay, Merlot and Cabernet blends. Cost is $55 per person. Call (858) 755-7100 for a reservation.